Baccarat is a classic casino game that’s been around for over 600 years. Nowadays the name baccarat is used to refer to a group of games including full-size baccarat, mini-baccarat and also punto banco. If you’re playing at an online casino it’s often just called baccarat, regardless of the specific rules. In this article we’ll explain baccarat rules, the key differences between different baccarat variations and then we’ll explore how this game originated in the 1400’s in Italy and grew into one of the most popular and common casino games in the world. Whatever version you find, don’t worry. They’re all really easy to play and they also offer one of the lowest house edges of any game in the casino. That makes them a great choice for people who want to get the most out of their money. In terms of cash flow, baccarat has been one of the most popular casino games in the world for years. Amazingly, over 90% of Macau’s entire casino revenue in 2014 came from different forms of baccarat. Like stated before baccarat has a very small house edge thus providing players a great opportunity to gain profit in a fast and, above all, fun way. If you’re playing low or medium stakes in a live casino or if you’re playing on a software version of this enticing casino game, chances are you’re playing punto banco or mini-baccarat. Full-size baccarat is usually reserved for high-stakes private rooms in casinos and the biggest difference is that it’s played at a huge table and the players actually get to handle and deal the cards. Punto banco and mini-baccarat are played at smaller tables and the casino dealer is the only one to handle the cards. Baccarat works by dealing two hands. One is called the banker hand and the other is called the player hand. It’s important to remember that these are just names. It might be easier to just think of them as Hand A and Hand B since you can bet on either hand. The winning hand is the one that gets closest to nine points. We’ll explain the scoring in a second. Your decisions in baccarat are really limited. The only choice you have is to bet on the banker hand winning, the player hand winning, or it being a tie. That’s it. You don’t get to make any decisions on whether to hit or stand, like in blackjack, so once you’ve made your bet you just sit back and let the dealer decide the outcome. The rules slightly favour the dealer hand winning so if you bet that side you must pay a 5% commission on winning hands. The dealer keeps track of how many commissions you owe and will ask you to pay it off when it gets big enough. Hands of baccarat start with the dealer giving two face-up cards to the player and banker boxes on the felt. Depending on what cards are dealt, the dealer may then give an additional card to the player and/or banker hands according to pre-determined rules. In baccarat aces are worth one point, number cards are counted at pip-value while tens and face-cards are worth ten points. The goal of baccarat is to get closest to nine by adding together the values of each hands’ cards. One big difference between baccarat and games like blackjack is that you can’t bust. In fact, the score never gets over ten because when you get to ten you just start again at zero. Because of that, you can think of tens and face-cards as being worth zero instead of ten. So a king and a five, for example, is a score of five. A seven and a six, for example, is a score of three. In baccarat there are two special hands called “naturals”. That’s when you get either an eight or a nine with the first two cards. A natural nine is the best possible hand and a natural eight is the second-best hand. If one or both of the hands is a natural, no more cards are dealt and the hand is over. To say there’s strategy in baccarat is a bit misleading since the player doesn’t have a lot of options to influence the outcome of the game. In real life, however, baccarat players usually spend a lot of time analyzing the recent hand history, trying to identify patterns and betting based on intuition and superstition. We’re not here to criticize anyone’s approach to gambling but the accepted scientific facts state that there is no meaningful way to predict the outcome of a hand of baccarat. First, never bet on a tie. The house edge in baccarat is really low when you bet on the player or banker hands (less than 1.5%) but it’s a whopping 14.4% when you bet on a tie. That means you’re throwing away $14.40 for every $100 you bet on the hand being a tie. The house edge when you bet the player hand is only 1.26% and it’s even lower at 1.04% when you bet on the banker hand, even with the 5% commission you have to pay. So if you want the best odds, only bet the banker hand. Generally the way people play baccarat is by sitting out a few hands and then jumping in with a bet when they think one side or the other is going to win the next hand. Like we said, baccarat players spend a lot of time keeping track of the outcomes of hands as they play and try to use that information to guide their betting decisions. Whether you’re playing live or online, the casino usually tracks the outcomes for you and displays them on a board similar to how it works on roulette tables. In baccarat, however, it’s way harder to understand what the tables and symbols mean. The easiest board to read is called the “bead plate” and it records only the outcomes of previous hands. Blue beads represent when the player hand won, red beads mean the banker hand won and green beads mean it was a tie. The history starts in the top left corner and moves down the column before starting again in the next column to the right. The other useful board is called the “big road” and it makes it easy to see if there’s been a lot of hot streaks for either hand. 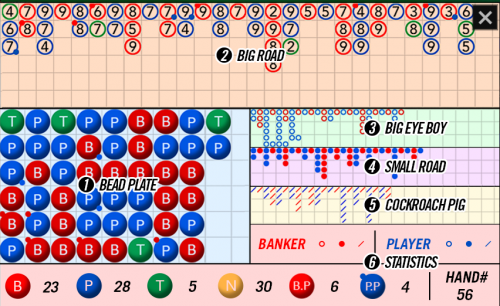 It uses blue and red circles to indicate player and banker wins, respectively. The history starts in the top left corner. When there are consecutive wins, another symbol is added below the last but when the opposite hand wins, you move one column to the right and start at the top. Ties are usually indicated with a green line through the previous symbol. Baccarat was first developed in Italy in the 1400’s and its invention is credited to Felix Falguiere. He called it baccara because that’s the Italian word for zero and all tens and face-cards were worth zero. Even though more theories exist explaining the origin of the game, this is the most well known origin of the games name. Over origins are portrayed as outright mythical. Like some people claim the game was originally based on the ancient legend of a virgin who was forced to throw a nine-sided die to determine her fate. Rolling an eight or a nine would bestow upon her the glory and honour of becoming a priestess, a six or seven would allow her to live but not participate in religious and community events while anything less than a six would earn her outright banishment to the sea. Baccarat spread to Italy’s neighbours France, where it was known as chemin de fer, and England. Long after, baccarat spread to the new world and in the 1950s landed in Las Vegas. Since then baccarat has gained immense popularity among Asian gambling communities in the USA and the casino centers of the Eastern world like Macau. 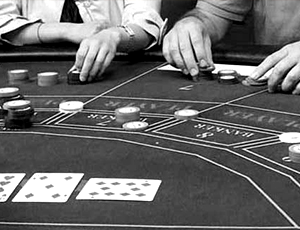 Baccarat never took over in Las Vegas but nowadays it accounts for the vast majority of Macau’s total casino revenue.